"An act of hospitality can only be poetic." I would like to extend a virtual hand out to this thought experiment in order to elongate its function and to hold space for the relationship between poetics and hospitality. Like poetry, hospitality is an art made possible by a proclivity for encounter. It is in the generosity of information, the cooking of a meal, the gifting of an object and all the other material and immaterial acts of care that hospitality is afforded an elevated and an everyday cachet. It is in these small accumulative gestures that poetry comes to us as a verb, able to carry bodies into foreign surroundings. Whether supple of language or embodied form, poetry as a state of doing (and in many instances of un-doing) is by its very nature open, malleable and parasitic. In the case of artist residencies, a limber approach to reciprocity defines how and why these modes of making operate. Hospitality comes down to a series of exchanges between people, places and processes that is grounded in a given location—however physically or experientially defined—and in many cases pries open a post-colonial unsettling of the complexities of occupation. In the case of Residency Projects’ pilot program in Boorhaman, Victoria, a peripatetic approach to site has been central to the project’s pragmatic and narrative outcomes. While the program was always set to take place in the small rural town of Boorhaman—located 18 kilometres to the north of Wangaratta in eastern Victoria on Pbangerang and Yorta Yorta country—its eventual form took four years to arrive at. It is with this extending impulse in mind that an analogy can be drawn between the project and what poets Rachael Zucker and Ross Gay refer to in conversation as the ‘sustained durational attention’ of the long-form poem. According to Gay, the long-form poem gives up the illusory task towards perfection and furnishes a space for the regular happenings of a life: the stuff of labour and failure, of domestic interference and all the additional noise elements that work their way into the final work. These noise elements can be understood also in terms of informational parasites, a third triangulated definition of a broader parasitism that Michel Serres draws out in his 1980 book The Parasite. As Astrid Lorange notes in her review of the book: ‘...a parasitic relation, refers to both parties of parasitism as well as that which passes between them—confused messages, un-received signals, extraneous symbolics and waste.’ The interlocution of this informational white noise can be located within the organisational structuring of the pilot program, as well as in the crux of works produced: from the material and functional negotiations to the incorporated waste elements of the project’s temporal sound and textile installations. And so, a series of lines can be drawn between the long-form poem, the parasite and the work of artist residencies such as Boorhaman; all revolve around a premise of residing within the work in order to arrive at an authentic expression of an original nucleus. One Saturday morning I arrive at Murnong House, family in tow, to an old homestead five minutes’ drive from the site of the program at the centre of the small town of Boorhaman, population 126. 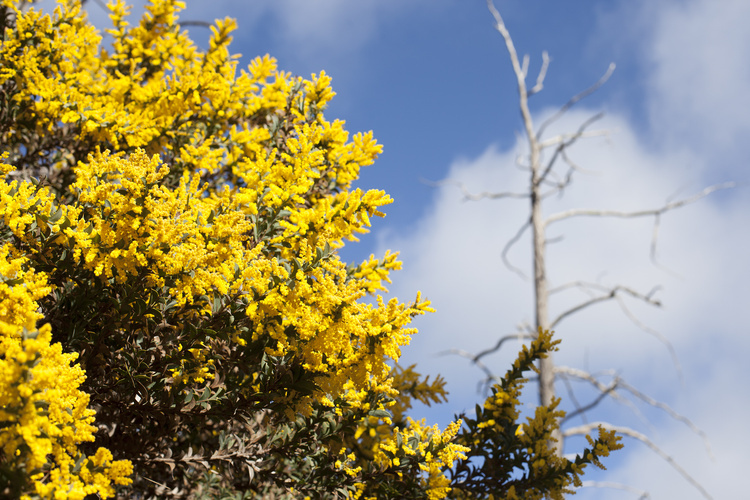 The property is accessed by two cattle gates, a periphery of citrus orchards and daubs of wattle that pop with the last rites of the spring season. The homestead is host to artists-in-resident Chaco Kato and Dylan Martorell, program founders and managers Kate Hill and Eugene Howard and visiting family members and guests. The house is old and well loved, with themed rooms honouring its owners’ occupations as Geologist on the one hand and Zoologist/Botanist on the other. Snake skins hang above the dining room door and the bathroom walls are papered floor to ceiling with Art Nouveau flowers of William Morris era, if not actually original. On entering the house, I gesture to its significance and ask how the connection to place was made. With a prior knowledge of Hill having been raised and schooled in Boorhaman, and her and Howard’s protracted history having studied together and as continuing collaborators, Howard makes the connection known. The house was owned by family friends, with visits to Boorhaman as a young person signifying his own personal relationship with the town before he and Hill ever met. He lets me in on a winsome moment the two shared at university when learning of this shared history. Despite having known these two and the basis of their relationship for many years, I arrive at an increased sense of kinship as I start to stack up the many layers of this project that resound with new conviction. It is at this point that a lithe approach to hospitality starts to gather in my mind, as a kind of puzzle piecing of the various actants that have enabled this project—artists, managers, sites, communities, funding bodies, materials and channels of internal and external feedback. There is no one host in this nexus, but rather a series of interchangeable relations that are responsible for the holding and being held: from the lemon-scented gum tree that holds Kato’s large weaving work; the structure of the school building that holds Martorell’s interactive sound installation; the various sites that hold the resident artists and managers and the program that holds the community in an open invitation for creative engagement. After a relaxed morning walking in the nearby Pbangerang (Warby) Ranges, we regroup and meet at the site of production: the disused Boorhaman Primary School, district no. 1996. Established in 1866, the original Boorhaman school was then known as a Common School, a forerunner to the State School model which provided equal opportunity to all children. With varying levels of attendance over the decades, the school eventually closed in late 2008 with seven pupils in attendance. Up until a few weeks prior to the residency’s launch, the local golf course and community hall were nominated sites of activity for the three-week long program. At this late stage, an original appeal to occupy the grounds of the school was granted by the Victorian Deputy Premier and Education Minister James Merlino, who personally owns numerous properties in similar stages of disrepair throughout the state. With the disused school and its grounds due for imminent redevelopment, permission to occupy the site was granted for the building’s external spaces only. Aside from one community member showing some dismay at the use of the school’s exterior spaces, Hill explains that most people were open and welcoming of the opportunity to engage the site through new creative avenues. Considering the nature of work being made—both site-specific, outdoor projects—what might otherwise be perceived as a functional limitation turns out to be an appropriate apparatus for a parasitic approach to institutional contingency and a genuine opportunity to engage the natural ecology of the site. In addition to Serres’ informational parasite, parasitism finds another expression via the word’s deconstructed etymology: by definition the prefix ‘para-’ describes the ‘sitting adjacent to’ as well as the ‘protecting of’ something, in this case the disused school grounds. While the term ‘parasite’ conjures up a spate of pejoratives that are exploitative in their crudest form, the expanded ‘para-site’ becomes an adjunct framework for the happenings of Residency Projects where the metaphor functions in the obverse. Rather than enacted as a process of extraction, parasitism here fulfils a complementary role. Take for example that the Latin derivative of parasite is ‘parasitus’ which literally means one who eats at the table of another. This definition offers a more gregarious appreciation of a reciprocal host/guest relation that is not conditional to exploitation, but one that gestures to the true ethos of artist residencies more broadly. By extension, custodianship and care become central modi operandi through which the broader concerns of the residency model can be called into question. Discussion turned to this during a conversation with Hill and Howard on the school grounds one mild afternoon in late September whilst sitting next to Kato’s work in progress. Some of the ways in which care was shown to the site included: neatly swept piles of debris gathered from around the schoolyard; hand dyed cotton cord stained from the lemon scented gum tree; a succession of native saplings planted at the front entrance to the school grounds and a myriad of other gentle and generous acts of preservation. Regardless of a clear trajectory for the program’s continuation in its existent form, there is the ability for these visible acts of care to communicate value in an efficacious way to a community attuned to the site’s future potential. 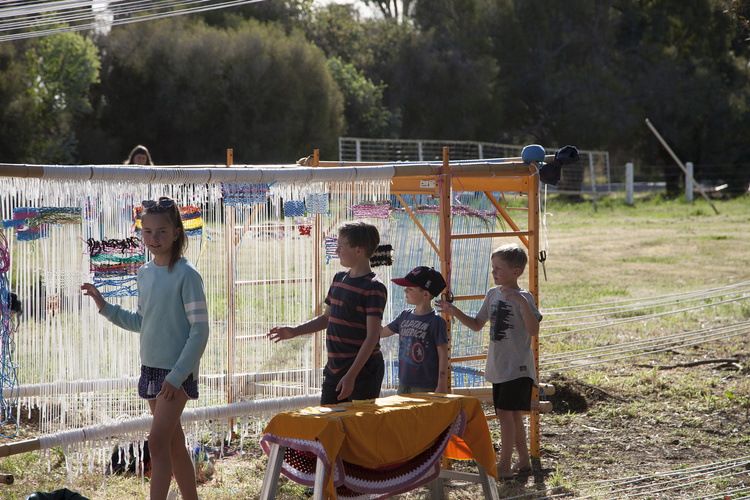 After a series of conversations with Boorhaman residents—often taking place at the local pub—a general consensus was observed regarding a desire for a community art centre to continue the work of the disengaged primary school. With the site’s future status up for negotiation at a local and state level, Hill and Howard see the pilot program as an opportunity to reify some of the proposed outcomes of the site, regardless of whether it can accommodate the pursuits of the program-at-large. While there is a marked sense of buoyancy when the two speak about the program’s possible future in Boorhaman, there is an understandable resistance to over-investing in the site beyond the immediacy of the programs current objectives. maintained working relationships with them both as employees, mentees and collaborators, in addition to their own shared history across exhibition making and site-specific project work. Across the fullness of these creative and professional dynamics, there is a keen attention on this operative word, slow. Not only does it relate to systems of value that are anti-capitalist and in many cases anti- or quasi-utilitarian, but it forms a congealing thread that speaks to what all four individuals have contributed to the experience in Boorhaman. Slow speaks to the four years of conversation and negotiation prior to the program’s implementation; it speaks to the meditative tasks of repeated weaving and digital post-production involved in the composites of the works and it encapsulates the shifts in body and mind that occur in the time taken to exit the city and enter rural time. Regarding this propensity for slowness, poetry finds shape through modalities of labour-production that are anti-capitalist in their adjunct function and yet salient to the work of the program-at-large. In The Hatred of Poetry, Ben Lerner confronts the dualistic nature of poetry as a kind of ‘scandal of leisure’ that is at once idealised and vilified. As Lerner proclaims, ‘...poetry checks the “calculative” avarice of a materialistic society, offering an alternative to a crass utilitarianism that is blind to everything that can’t be instrumentalized; the use of poetry is therefore entwined with its uselessness...’ In the case of Kato and Martorell’s work, this scandal of leisure turns out to be one of its primary functions. Rather than presenting a mere alternative to capitalism’s ‘crass utilitarianism’, their work ingests and recapitulates its material bi-products in an atavistic way, redressing the everyday functionality of objects as leisurely pursuit: kitchen utensils become musical vessels; washing machines and oil drums become centrepieces for ad-hoc installations and discarded thread becomes a medium to encourage the play of somatic and linguistic tissues. The material used in a text written on a wall are: “stone, cement, plaster, carbon-based ink” (variable). If the work is only spoken, the materials are: “human larynx and tongue, airwaves (carbon dioxide, nitrogen, oxygen, and other gases), ears. The various material utterances that rested upon the Boorhaman school grounds over the course of the three weeks resulted in new passages of pedagogy and recreation being woven into the fabric of the site’s history. Both Kato and Martorell’s participatory works constituted a series of material and social exchanges that invited input in the form of: heavy cotton cord; human breath; recycled textiles and fibres; conversation; wind; DIY sound triggers; performance; bamboo scaffolding; green screens and more. Consistent with Slow Art Collective’s emphasis on the slippages between artist and viewer, it is important that the work they engage either collectively or as individual practitioners instils a horizontal approach to collaboration and questions of material authorship. Processes of gathering, collecting and subverting furnish what has been widely noted of Martorell’s work as a bowerbird aesthetic and what I might go so far as to call (courtesy of Lorange) a “ratbag modality”, the ratbag being “the official avatar of verse culture.” These largely ad-hoc material processes become site-responsive harbingers to engage not only a community instructive in the work’s final composition, but extensive networks of human labour production that generate initial raw materials and potential disposing of their eventual bi-products. For the first half of the residency, Hill and Howard accompanied the artists to various sites around Boorhaman to source materials. Trips were made to Wangaratta to the Bruck Textiles factory, various salvage yards and the Australian Country Spinners which had recently announced its decommissioning in light of a recent buy-out by the Bendigo Woolen Mills. The use of fluoro and high visibility fabrics collected from the Bruck Textiles factory enabled a highly demonstrative juxtaposition between the site’s originary structure and its material sublimation. It also performed a double role in redressing the site as an easily perceptible and welcoming space for interaction from a local audience familiar with the original use-value of the materials across industries of agriculture and construction. Further to the use of these textiles, Martorell collectivised a range of salvaged source material together with items from his personal archive. Of those items collected from the periphery of the school grounds, many locals were overwhelmed to discover how these common everyday objects could be transformed to produce such resonant sounds. The use of site-specific materials helped to achieve what Miwon Kwon outlines as one of the primary goals of community-oriented art projects, that “in order for a public art work to be meaningful to the public (thus, meaningfully public), it should not ‘unsettle perceptions’ but ‘reassure the viewer with an easily shared idea or subject.’ By incorporating objects familiar to the community, there is a greater sense in which the everyday material world can be communicated as a site of renewed creative potential. For how diverse their individual and collective practices are, Kato and Martorell’s works are codified by a kind of maximalism that is frugal and exuberant at the same time. 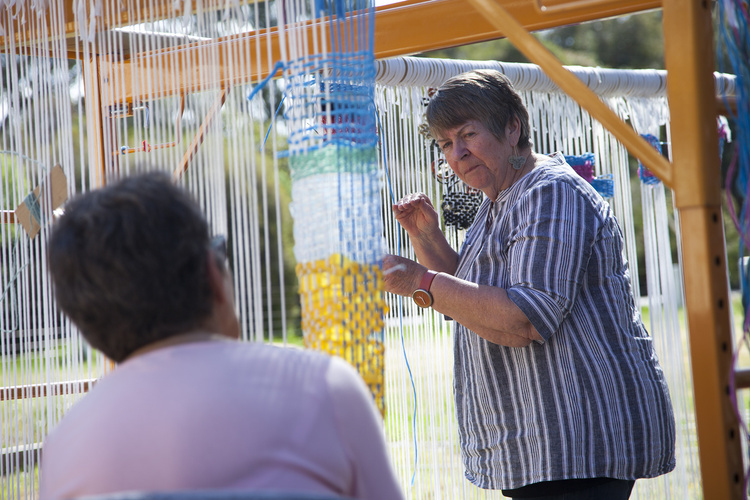 After a series of material negotiations with Hill and Howard, Kato arrived at the use of an Australian grown and locally manufactured natural fibre cotton cord to form the primary base material for her large-scale woven installation. While not eliciting the same measures of perceptibility as Martorell’s work (with regards to Kwon’s assertion above), Kato’s iconic macramé patterning did a similar thing in positioning the work for a local community, when read in context to the old Boorhaman Primary School. With the assistance of her teenage son, Kato installed her work in close proximity and adjacent to a surviving student mural honouring the nearby Torryong (Ovens) River. When read in lieu of its backdrop and historic surroundings, the hull of Kato’s work becomes strikingly redolent of the material associations of fishing; an area of local ecological activity that saw the last active student body participate in the region’s Waterwatch program. Extending in a sweeping, tentacular fashion out from the main structure, this large scale work proffered a schematic complexity while being consonant with and minimal in its impact on the surrounding environment. As an offshoot to the main work, Kato created a subsidiary woven loom in which she used the same base material held in place by a series of steel and bamboo scaffolds. This adjunct structure performed a similar role to Martorell’s work in that it provided the material basis for a series of provisional collaborations in the form of woven works produced by members of the local community. With many of their material processes and working methodologies gathered during extensive travel abroad, Kato and Martorell’s works invite opportunity for cross-cultural interaction that shape entirely new expressions of material associations within disparate environments. Throughout the residency program, a series of workshops, school visits, artist talks and an open day all provided occasion for a range of participant-oriented outcomes. These included a weaving workshop that Kato ran for adults and children aged 8 years and over where she taught participants various techniques for working into small hand built looms and larger architectural looms. Martorell ran a two-part workshop that encouraged participants aged 8-16 years to play with a range of recycled parts and farm equipment to produce sound based sculptures. During the second workshop, these pieces were incorporated into a performance which was filmed in front of a makeshift green screen. With Hill and Howard in ongoing consultation with the community throughout the program’s duration, all of these activities necessitated a space for reciprocity and dialogue around the effectiveness of Residency Projects’ activities in Boorhaman. Hill and Howard made particular effort to speak to the parents of those participants involved in on-site workshops to evaluate how these activities could re-energise thinking around the school’s future. Well enlightenment is useless but I find interesting the distinction anthropologists make between an emic and an etic point of view. Emic has to do with the perspective of a member of the society itself and etic is the point of view of an outsider seeing the society in his own terms. En rapport with the pith of themes addressed by this program was a chance encounter captured on video during documentation on-site in Boorhaman. In a beautiful role reversal between nature and the anthropomorphic, a pair of swallows are shown darting from corner to corner within one of the demountable school buildings. While the humans were busy working alongside the natural elements outdoors, local fauna had come to occupy the peopled spaces which were eventually submitted to abandonment and decay. The few seconds of video that shows the swallows cajoling us into the spaces of pedagogical abandon is like a bucolic simile of other mythological tropes that describe the guest-host dyad. I’m thinking here of the Greek xenia whose root word translates to both guest and host. Xenia is synonymous with the narrative of Homer’s The Odyssey—one of the oldest poems in the Western tradition—as when Helen of Troy is presented to us in Emily Wilson’s translation (the first ever by a woman), as an unusual female character who embodies the dual role of both guest and host. As Wilson explains, it is in Helen’s ability to move around in other people’s spaces, all the while holding her role as host, that this double agency can be seen to occur. Of a community’s ability to express its particular credo of xenia (in Homeric terms there is both good and bad xenia), the work of Residency Projects has enabled opportunities for collaboration and play with a plenitude of other guest/hosts on less binarised and binaural terms. The looping and feeding back of participant involvement in the form of DIY sound sculptures, improvised performance and embodied weaving have resulted in a process that Kwon sees as a central objective of community-based site specific work. As she explains it, it is ‘work in which members of a community—as simultaneous viewer/spectator, audience, public, and referential subject—will see and recognize themselves in the work, not so much in the sense of being critically implicated but of being affirmatively pictured or validated.’ It is through a multi-directional seeing and recognising of the self in the work of the other that this program has successfully engaged what Carson describes above as a kind of surrogate enlightenment. It is through respectful attention to the emic and the etic that Residency Projects have managed to so quickly establish the work they do as relevant across a range of communities and contexts. From February 24th until March 25th the Wangaratta Art Gallery hosted an exhibition of works made during and in the months after the Residency Projects Spring 2017 program in Boorhaman, Victoria. Curated by Kate Hill and Eugene Howard, this exhibition featured artworks by Chaco Kato, Dylan Martorell and the community of Boorhaman, Victoria. Anne Dufourmantelle and Jacques Derrida, Of Hospitality (Stanford: Stanford University Press, 2000), 2. Rachael Zucker and Ross Gay, ‘Episode 25—Ross Gay’, published April 11, 2017, in Commonplace: Conversations with Poets (and Other People), https://www.commonpodcast.com/home/2017/4/11/episode-25-ross-gay. Astrid Lorange, ‘Ratbag’s Polemic’, published March 31, 2013 in Cordite Poetry Review, http://cordite.org.au/essays/ratbags-polemic/. ‘Boorhaman’, Victorian Places, accessed January 24, 2018, http://www.victorianplaces.com.au/boorhaman. Ben Lerner, The Hatred of Poetry (Melbourne: The Text Publishing Company, 2016), 52. Jimmie Durham, Material (dOCUMENTA (13): 100 Notes—100 Thoughts / 100 Notizen—100 Gedanken | N°049) (Ostfildern: Hatje Cantz, 2012), 4. Miwon Kwon, One Place After Another: Site-Specific Art and Locational Identity (Boston: MIT Press, 2014), 96. ‘Boorhaman Primary School: Ovens River tribute’, Environment Victoria, May 5, 2007, https://environmentvictoria.org.au/action-story/boorhaman-primary-school/. Anne Carson, Plainwater: Essays and Poetry (New York: Random House, Inc., 1995), 223. Abbra Kotlarczyk is a visual artist and writer based in Melbourne. Her practice is hinged on visual and linguistic articulations of subjectivity, trans-historicism and expanded notions of publication. 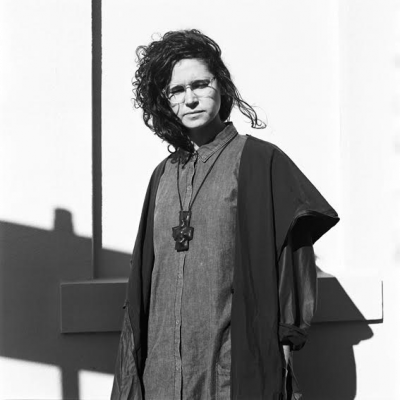 She has participated in solo and group exhibitions at North Projects (NZ), Bus Projects, c3 Artspace, TCB, Lindberg Galleries (Australia) and AIRY Gallery (Japan). Her essays and reviews have been published by Transgender Studies Quarterly (Duke University Press), Decoy Magazine (Canada), un Magazine and Das Platforms (Australia). This project has been assisted by the Australian Government through the Australia Council, its arts funding and advisory body, the Victorian Government through Creative Victoria and by the Besen Family Foundation through Creative Partnerships Australia's Cultural Fund.